A country, blessed with oil-rich soil, makes a lot of money due to the sky-rocketing oil price. A lot as in 300 billion dollars (and counting). What do they do with this money?They invest it. Yes, with the purpose to provide for the future generations. So far the investment makes a return of 7.9% a year. (last time we checked, if you open a time deposit at Indonesia's giant Bank Mandiri, you get 7%). At the rate it is going, in a decade it will translate into $180,000 for every man, woman and child in the country. The story doesn't end there: In order not to overheat the country's economy, they have to invest this large sum of money elsewhere, and so they go: investing the money all over the world. Not just investing for highest return, but investing with a conscience. The country sold off more than $400 million Wal-Mart shares because "the retailer was guilty of tolerating child-labor violations by its suppliers in the developing world and obstructing (labour) unions at home". 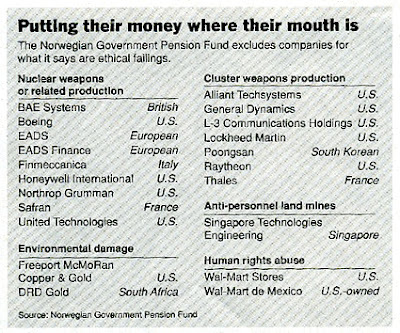 Other companies on their 'no' list are Singapore Technologies Engineering (for producing anti-personnel land mines), Lockheed Martin (for producing cluster weapons), Boeing (for producing nuclear weapons), and more. One company familiar to us is on the list: Freeport McM0ran: Why ? Because Norway accuses it of causing 'severe environmental damage at its copper and gold mine in Indonesia'. How about that. The Norwegians care. What about us Indonesians? Do we care? Or are we going to simply dismiss it by saying: The Norwegians have 300 billion dollars. ... We don't." well that's it, norway can afford to care - ri can't! that's why u don't have too many mines nowadays in wealthy countries. wowwww, so what if they have 300 billion, it's about being responsible with their money and i guess that's what they were about. Wait a minute... it's not like Indonesia doesn't have any money. We do, it's just that our government isn't as responsible with the money. When people suffer and have to worry about putting food on the table, that's all they think about. We need to abolish poverty first. Another excellent post. But why must you keep us waiting for so long guys? It's not about "affording to care", John O, it's about caring per se. Where there's a will, there's a way. As for abolishing poverty, if it's a matter of money, Indonesia has it and accumulating it fast. It's sitting in banks. govt pension fund is a long-term investment. it's about risk management, nothing to do with care. its strategy has already included risk identification for such controversy risk that may lead to uncertainty in the future as a result of unethical business conducts. we just interpret it as a care, but this is not necessary. We have around, what, 220 million people in Indonesia? Abolishing poverty in a country that big is gonna take a hell long time. Too many people + big government = recipe for disaster. Err, anybody knows how to change my nationality?